Mission Bay Park was originally a tidal marsh that was named "False Bay" by Juan Rodriguez Cabrillo in 1542. It was developed into a recreational water park during the 1940s, 1950s, and 1960s. The San Diego River had historically shifted its terminus back and forth between San Diego Bay to the south and "False Bay" to the north. During the 1820s the river began to empty primarily into San Diego Bay, causing worries that the harbor might silt up. In 1852 the United States Army Corps of Engineers constructed a dike along the south side of the river to prevent water from flowing into San Diego Bay. 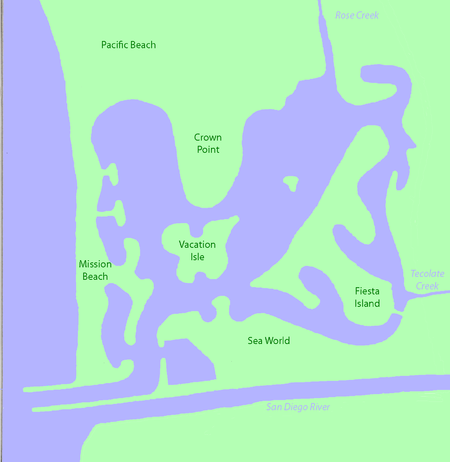 This made "False Bay" an estuary outlet for the San Diego River drainage. Unfortunately the dike failed within two years. Finally in 1877 the city erected a permanent dam and straightened the river channel to the sea, giving the river its present configuration. Today the San Diego River is constrained on both the north and the south by levees (San Diego River Flood Control Channel), and it no longer drains to the ocean through Mission Bay, other than through a weir located at the entrance to Mission Bay. During the late 1800s some recreational development began in "False Bay" including the building of hunting and fishing facilities. These facilities were destroyed by flooding that took place years later. The first modern swim/bike/run event to be called a "triathlon" was held at Mission Bay, San Diego, California on September 25, 1974. The race was conceived and directed by Jack Johnstone and Don Shanahan, members of the San Diego Track Club, and was sponsored by the track club. 46 participants entered this event. It was reportedly not inspired by the French events, although a race held the following year at Fiesta Island, San Diego, is sometimes called "the first triathlon in America." Approximately half of the park was once state tidelands. Mission Bay Park was transferred to the City of San Diego with several restrictions, some of which were adopted into San Diego City Charter by public vote, with others implemented as part of the California Coastal Commission's oversight of local planning and land use decisions. One of the restrictions sets a limit on commercial development of leaseholds, so that no more than 25% of the land area and 6.5% of the water area can be used for private purposes. This assures that most of the acres making up Mission Bay Park are available for public recreational use. From 1957 to 1962 large amounts of industrial waste, including millions of gallons of hydrofluoric, nitric, sulfuric, and hydrochloric acids, dichromate, cyanide, and carbon tetrachloride, were deposited into an unlined landfill located in the south shores section of Mission Bay Park immediately east of SeaWorld. No remediation efforts have occurred. Several water areas are dedicated or restricted to particular forms of water recreation, with specific separate areas for sailing, water skiing and personal watercraft use. Mission Bay is one of the premier locations in Southern California for the sport of rowing, or "crew." One of the largest rowing regattas in the country is held on Mission Bay each year: The San Diego Crew Classic is held in Mission Bay every spring, featuring two days of competition in eight-oared shells rowed by more than 100 college, club, and senior crews. 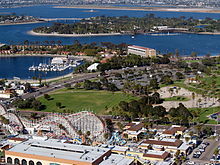 Attractions at Mission Bay include SeaWorld San Diego, Aqua Adventures for kayaking and paddleboarding, the Mission Bay Cross Country Course, the Mission Bay Golf Course, and Belmont Park, which features the Giant Dipper Roller Coaster and other rides. On shore there are activities such as golfing, picnicking, riding bikes along the paths, playing volleyball, and flying kites. There are nearly 14 miles (23 km) of bike paths along Mission Bay. The San Diego Visitor Information Center was constructed in northeastern Mission Bay in the 1960s, and it served its purpose until it closed down in 2010. There are now plans to convert the building into a counter-style fast-casual restaurant, scheduled to be opened in late 2018. The Mission Bay cross country course is a European-style 2,000 meter grass loop running along east Mission Bay Park. The terrain along the first 1,000 meters of the course is primarily flat. During the second 1,000 meters of the course it includes a series of five small grass inclines. The average width of the course is 15 meters with sections 5 meters in width. It is the home course for the UC San Diego Tritons cross country teams. Scenic Mission Bay Golf Course and Practice Center, designed by Ted Robinson, former president of the American Society of Golf Course Architects, proudly opened its gates May 27, 1955 as a nine-hole course. In the early 1960s Robinson designed what is now the 18-hole executive course. The 18-hole executive course, measuring 2,719 yards, sits on 46 acres in the heart of the City. It is the only golf course in San Diego with night lighting. The center is a long-time favorite golf course for locals. It is where Tiger Woods won a Junior World title. Some areas in Mission Bay Park require dogs to be on leashes, other areas such as Fiesta Island are leash-free, and other areas do not allow dogs at all. There is a youth campground located on Mission Bay's Fiesta Island. Throughout the year youth groups with their leaders enjoy a full camping experience along with daytime water experiences and classes. A permit is required to use this site. It is unlawful for adults to camp, sleep overnight or lodge overnight anywhere in Mission Bay Park except as a leader of a permitted youth group. The California Office of Environmental Health Hazard Assessment (OEHHA) has developed a safe eating advisory for Mission Bay based on levels of mercury or PCBs found in fish caught here. Mission Bay Park is home to many rare and endangered species, including the California least tern. A program goes into effect every April through August to protect this bird at four of its nesting sites in Mission Bay Park. The California least tern has more than tripled in number since it was put on the endangered species list, and has many colonies from San Diego Bay to the San Francisco Bay area. Most are fenced and protected from public access. The major cause for its decline was habitat destruction and alteration, as occurred in Mission Bay. Predators like the gull-billed tern red fox can decimate a crop of chicks; therefore, predator control, either by removal or elimination, has been instigated at some colonies. Non-endemic ants are a problem at some Mission Bay colonies, as they ear chicks alive, and are often controlled there. Even with annual losses from depredation, since the least tern was listed, it has continued to thrive. Being on the Endangered Species list allowed protection of the terns' habitat, and allowed the natural rebound and growth of the colonies. Colonies at Mission Bay are either fenced or reachable only by watercraft. In a multi-agency effort that includes the City of San Diego Park and Recreation Department, the U.S. Department of Fish and Wildlife Service, the California Department of Fish and Game and the Wildlife Services Program of the U.S. Department of Agriculture, professionals from the wildlife program carry out the humane trapping of predators that are attracted to least tern nesting sites. This includes skunks and opossums, as well as feral cats and dogs, believed to be former pets who were abandoned by their owners. Sites are located on North Fiesta Island, Mariner's Point, Stoney Point, and a small island called "Government Island", which is used by the Federal Aviation Agency and houses a VORTAC station. ^ Smythe, William E. (1908). "Part Seven, Chapter II. SAN DIEGO BAY, HARBOR AND RIVER". History of San Diego, 1542-1908. I. An Account of the Rise and Progress of the Pioneer Settlement on the Pacific Coast of the United States, Volume 1. The History Company. ISBN 978-1313239028 – via San Diego History Center. ^ Tinley, Scott. Triathlon. A Personal History. pp. Page 6. ^ "Triathlon - Olympics Sports - 2008 Summer Olympics - Beijing, China - ESPN". espn.go.com. Retrieved 2016-02-18. ^ DeWyze, Jeannette (July 20, 2000). "Something Stinks in Mission Bay". San Diego Reader. ^ Water Quality Control Policy for the Enclosed Bays and Estuaries of California, State Water Resources Control Board, State of California (1974). ^ "Mission Bay Park Rules". laketarpon.org. ^ "San Diego Crew Classic". San Diego Crew Classic. ^ "Kayaks & Paddleboards - Aqua Adventures San Diego". Aqua Adventures Kayaks and Paddleboards. ^ "Mission Bay Golf Course - City of San Diego Official Website". www.sandiego.gov. ^ "New Restaurant in the Works For Shuttered Visitors Center". nbcsandiego.com. ^ "More Details Emerge About Mission Bay's New Waterfront Eatery". eater.com. ^ "Toreros XC Hosts USD Invite on Saturday". usdtoreros.com. Retrieved 2018-09-05. ^ "TheFlyStop.com Guide Service". theflystop.com. ^ Admin, OEHHA (2014-12-30). "Mission Bay". OEHHA. Retrieved 2018-06-13. ^ Taketa, Kristen (March 19, 2019). "On an island in San Diego, an endangered bird species faces tough odds to survive". Los Angeles Times. Retrieved 2019-03-20. Grossinger, Robin; Stein, Eric D.; Cayce, Kristen; Askevold, Ruth; Dark, Shawna; Whipple, Alison. "Historical Wetlands of the Southern California Coast: An Atlas of US Coast Survey T-sheets, 1851-1889" (PDF). California State Coastal Conservancy, San Francisco Estuary Institute (SFEI), Southern California Coastal Water Research Project (SCCWRP), California State University Northridge (CSUN). Retrieved 2 March 2018. 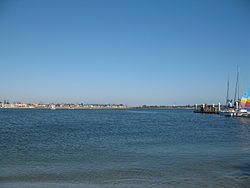 Wikimedia Commons has media related to Mission Bay (San Diego). This page was last edited on 20 March 2019, at 04:26 (UTC).